Apiary covers the first theme to a first class standard, and you will see Apiary called out for its ability to document APIs in a lot of articles. Well written API Blueprints will cover the bulk of the second bullet. But the other points tend to fall outside of a Blueprint and fit more the API Policies and their use. Not everyone is so commited or enjoys writing documentation. The other driver for going beyond the use of Apiary is that some organizations feel the need to have a traditional word style document to capture/define an API’s contract in detail. 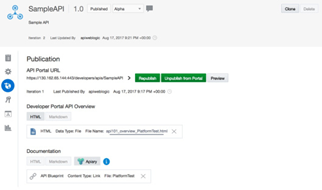 With the API Platform the management portal enables an API to be published into the developer portal with the Apiary definition and a markdown file for further documentation. As you can see some of the information about the policies should be incorporated into the documentation. So how, can the gap be addressed easily. Within the policy definition is the means to provide documentation, as illustrated below. This provides an opportunity to record a more general explanation as to what and how to address that policy. Read the complete article here.